Sulzer employees celebrate 70 years in Brazil. Image copyright Sulzer. 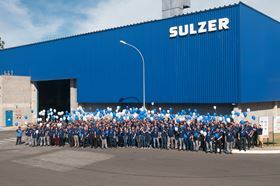 It is 70 years since Sulzer started operations in Brazil with its first manufacturing site in São Bernardo do Campo, São Paulo. Since the first machine was imported from Switzerland in 1948, Sulzer has continued to grow its businesses in Brazil. Starting with small and medium-sized pumps for general industrial use through pumps for oil and gas industries, large pumps for water transportation, compressors and specialized services in turbines and other critical rotating equipment, Sulzer has continued to expand its portfolio. Over the years, Sulzer in Brazil has designed, manufactured, delivered and serviced equipment all around the world. GE Power India has contracted Sulzer India to provide 21 barrel-type boiler feed pump sets for three new thermal power plants in Uttar Pradesh.